Ciaran is one of the Four Knights of Gwyn who laid waste to Gwyn's enemies through assassination and subterfuge. After the death of Knight Artorias in Oolacile, she is found paying her respects to her friend. She requests that the player give her the Soul of Artorias in exchange for her two weapons, the Dark Silver Tracer and Gold Tracer. 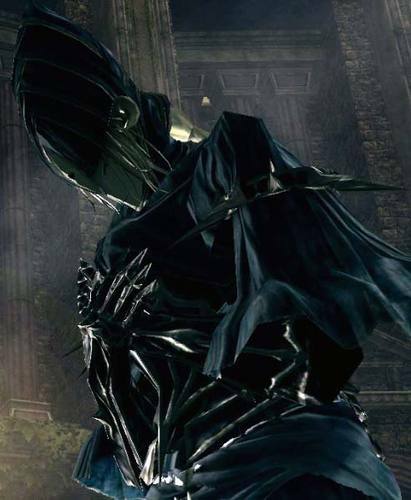 Her dialogue and the fact that her Hornet Ring is found behind Artorias' grave on a female corpse in the base game implies that she was very close to the fallen knight and possibly had feelings for him. Her armor description implies that she was the leader of the Lord's Blades. Alternate Dialog where she would have made remarks if the Wolf Ring or the Soul of Artorias was in the players inventory, as well as imply that Marvellous Chester has stolen the ring. Why have you the ring of Artorias?/ Why have you the soul of Artorias? I know not how you came upon it, but its owner met his death here. He was a dear companion, and I wish to return the ring to his grave. Then thou must be wary of Ciaran. She had strong feelings for the great Artorias. …You, is that not… The soul of the man who fell on this spot? He was a dear friend. I wish to pay proper respect, with that soul. Would you be willing to part with it? Porcelain Mask Mask of the Lord's Blade Ciaran, one of Gwyn's Four Knights. The cyclops headpiece is common to all of the Lord's Blades, but Ciaran was determined to earn this soft porcelain mask as a unique decoration of honor. The mask is lined with ivory locks of hair. Lord's Blade Set Common to all of the Lord's Blades. These deadly women shift nimbly between layers of darkness, etching streaks of gold into the night air, and planting visions of terror into the minds of their targets. Hornet Ring One of the special rings granted to the four knights of Gwyn. The Hornet Ring belonged to the Lord's Blade Ciaran. Gold Tracer Curved sword used by the Lord's Blade Ciaran, of Gwyn's Four Knights. Ciaran brandishes her sword in a mesmerizing dance, etching the darkness with dire streaks of gold. Dark Silver Tracer A dark silver dagger used by the Lord's Blade Ciaran, of Gwyn's Four Knights. The victim is first distracted by the dazzling streaks of the Gold Tracer, then stung by the vicious poison of the dagger.